Home » Blog » Run Ethiopia in 2018! Are you bored of your monotonous run around the park or on the treadmill at your gym? We have the perfect escape of routine for you! Try doing it alongside thousands of vibrant Ethiopians and experience all the country’s magical offerings by joining our Run Ethiopia Tour! The tour provides the opportunity to participate in two 10k runs in two cities: the Great Ethiopian Run in Addis Ababa and the Race for Girls’ Education in Gondar organised by us along with our sister charity the Kindu Trust. The days between races will be spent exploring northern Ethiopia and will be designed around what you, the guests, are most interested in. Africa’s biggest race is colourful, chaotic, vibrant, and fun, and there is no better way to see the country’s capital, Addis Ababa. 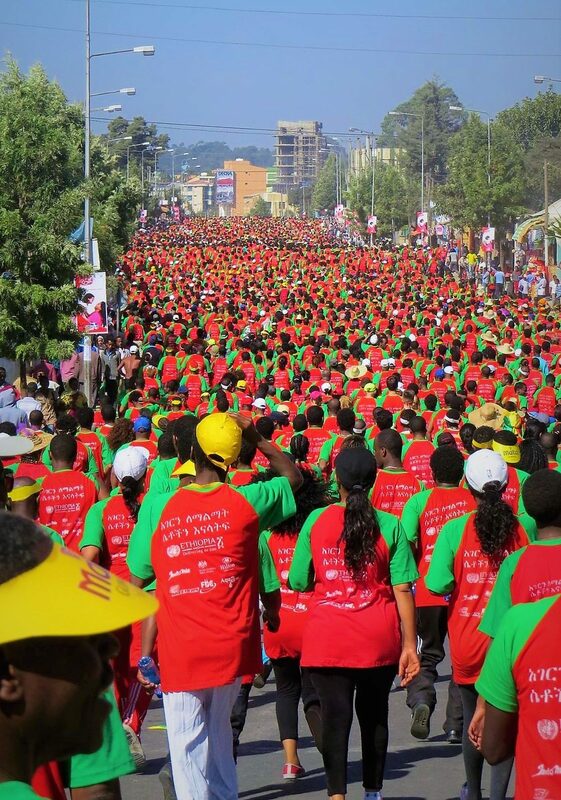 Around 44,000 participants paint their faces with the colors of the Ethiopian flag, put on their identical t-shirts, and jog, dance, and laugh their way through the heart of the bustling city. Founded in 2001 by our patron and arguably the greatest distance runner of all time, Haile Gebrselassie, the front section of the race could not be more competitive. Its winners consistently end up having successful international careers, and it is a yearly showcase of Ethiopia’s superior talent pool. However, behind the elites follow thousands of participants taking in the atmosphere, stopping for drinks at roadside stations, and dancing to live music. 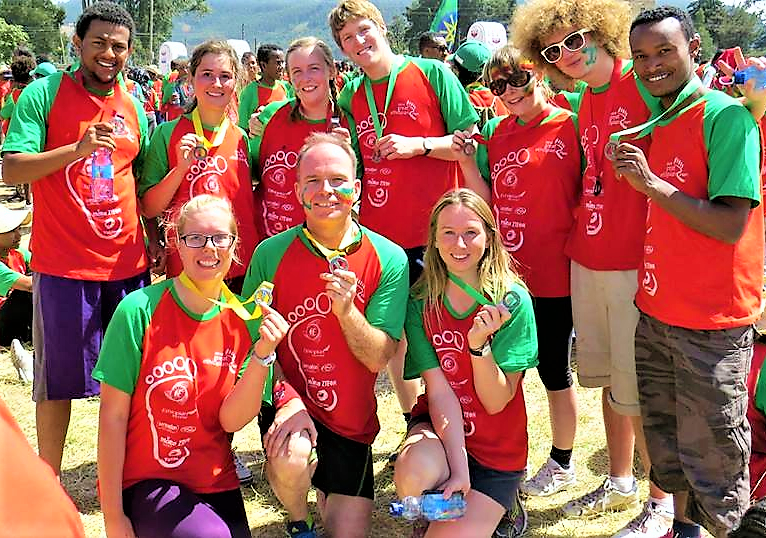 Experience Ethiopia’s liveliness by taking part in Africa’s largest race! This run through historic Gondar is being organized by Link Ethiopia and our sister charity, the Kindu Trust. It will be held as part of a local event to highlight the importance of girls’ education and celebrate what can be achieved by supporting girls through their schooling. You will be running alongside 1,000 locals, mainly girls in education and local figures who have played a significant role in supporting girls’ education. We would love to have international participants to run alongside locals and contribute to the importance of this cause. An African proverb which says “If you educate a man, you educate one person but if you educate a woman, you educate a nation” has come to be supported by real data which shows that educated women not only increase their personal earning but also reduce poverty, increase life expectancy in their community, and carry it on to next generations. At Link Ethiopia, we believe that educating girls is vital for social and economic development, and we hope you help us spread this message by joining our race! The week between races will be designed according to your wishes! With so many spectacular sites to offer, choosing what to see is always a challenging decision to make. However, our experienced and knowledgeable team is here to help! Some examples of must-see sites include Gondar, the historic city of Lalibela, and the beautiful Simien Mountains. Lalibela boasts some of the only rock-hewn churches in the world, while Gondar is home to historic castles. The Simien Mountains offer great trekking in picturesque scenery and are home to Gelada monkeys, solely found in the Ethiopian highlands. You could also go on a boat ride to see hippos and watch the beautiful sunset on Lake Tana, the source of the Blue Nile. Experience Ethiopia’s historic sites, exotic wildlife, unique culture, delicious food, and of course its hugely welcoming people your way! We estimate the cost for this bespoke tour will be £1,600 per person, though price will depend on the chosen itinerary. All costs of the trip are included from hotel to dinner, flights are not included. We also ask each runner to aim to fundraise at least £400 for the Race for Girls’ Education in Gondar, with all donations going to our work in Ethiopia. 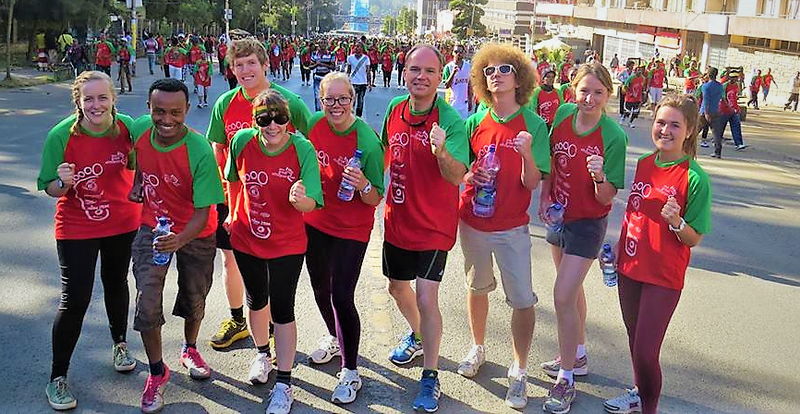 Want to be part of Run Ethiopia? Contact us at [email protected], we will share with you some of the options to visit in between the races and while you’re training up to run Ethiopia, we will confirm the itinerary! Next PostTour Ethiopia this Year!